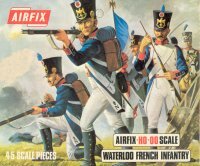 The first few sets from Airfix were not well sculpted, and many were subsequently redone to match current standards. Long before this set was produced, however, Airfix was producing good high quality product consistently. Therefore this set begs the question, what on Earth went wrong here? It's not that the detail is poor, just that the figures bear only a vague resemblance to human beings. Legs are thin and spindly, and everyone seems slightly hunchbacked. The whole anatomy is unconvincing and, quite frankly, ugly, making them look more like some sort of troll or similar fantasy creature. Some of the poses are equally bizarre. The private reloading his musket is leaning so far forward he seems like he is forcing his ramrod with all his strength (which admittedly was not unknown). The trumpeter is holding his instrument by the mouthpiece, which would make the whole thing seem very heavy and is simply a stupid way of doing it. Finally, the man running forward holding his musket to his left ear leaves you simply wondering what he is trying to do. One of the more conventional poses, that of the man marching in the first row, is also poor because he holds his musket on the incorrect, right shoulder. All this is a pity as the uniforms are largely accurate, although not representative of the bulk of the French infantry at Waterloo. The short-tailed Bardin coatee is more or less modelled here, and the rest of the uniform, including the shako, is reasonably well done. These men carry a sword and bayonet scabbard on a cross-belt over the right shoulder, which makes them all grenadiers - only a fraction of the total infantry, the bulk of whom were fusiliers with different equipment. However these figures all have shoulder straps, like fusiliers, not the fringed epaulettes that grenadiers wore, and none have the usual grenadier plume on the shako, so signals are mixed and accuracy confused. In addition, the flag-bearer is missing the most important bit - the eagle on top of the staff, and the drummer wears a uniform identical to that of the soldiery, when most drummers would have worn the regulation Imperial Livery, which was noticeably different. In truth Waterloo saw many French infantry with far less than the regulation uniform, but one very common aspect was trousers or overalls, which covered the gaiters seen here, so again a less than authentic feel to these figures. One man has gaiters reaching to above the knee, which was not regulation by 1815 but seems reasonable given the unofficial diversity of uniform during the Hundred Days. Some of the poses are very interesting and unusual, with none more so than the man evacuating a wounded comrade from the field over his shoulder. However the man holding his musket to his left ear defies explanation. The mounted officer is a nice addition, although the set could have used an officer on foot too. The officer is properly dressed with fringed epaulettes and long coat tails, but sits uneasily on the classic Airfix horse with very uncertain connection to the separate base. War is ultimately all about killing, and Airfix are one of the few manufacturers to portray casualties in their sets. Far too many ignore this aspect, and seem to run the risk of glamorising what is a horrific activity that destroys millions of lives through death, injury or bereavement. Airfix should be applauded for showing all aspects of a battle, not just the 'attractive' parts. In a set full of disappointments the biggest problem is the very peculiar sculpting. There is also a good deal of flash and extra plastic that must be removed, and both officer and his horse have disfiguring mould marks. All this leaves this set faring badly against the increasingly large number of far superior alternatives available today.